Our new plans are: In 2017 we will focus on building networks and partnerships. We will run events during festivals, and help you plan events, but we are moving the week to the warmer month of April 2018. Over 2,200 people attended events, and over 100 groups organised them. We collected information, surveyed organisers and attendees and ran two in-depth evaluation sessions. We had brilliant feedback: 98% of people surveyed said they would make changes to make their life more sustainable, and most of the changes will relate to consumer choices. Our in-depth sessions looked at what would make the week even better for the district - and we made our decision about the date, and about bigger and better collaboration - based on your feedback and these productive sessions. 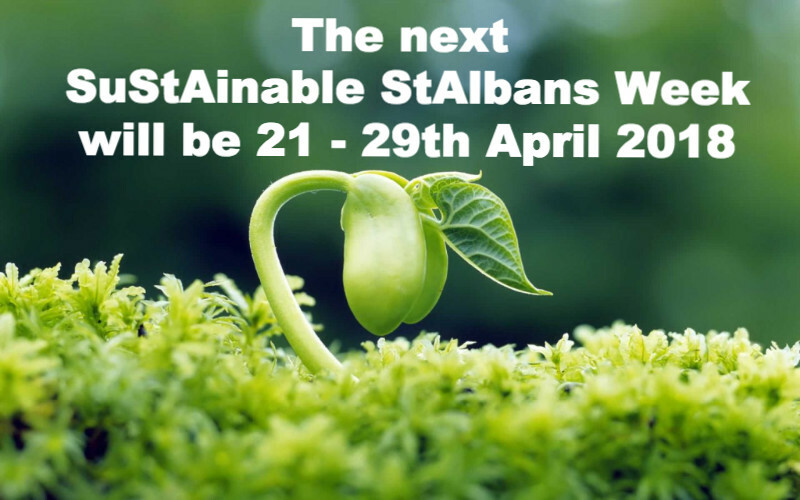 Sustainable St Albans Week aims to inspire people across St Albans, Harpenden and the villages to help build a more sustainable district.